Order Custom Apparel For Your Adventure Club This Summer! HomeBlogBlogDesign Custom Apparel For Your Scout Troop! Design Custom Apparel For Your Scout Troop! Here in the country of Canada, where we are fortunate enough to live, there is a rich tradition of scouting and outdoor adventure that can be traced all the way back to the early twentieth century! The core values of the scouts, which provide educational and adventuring opportunities for youth between 8 and 26 years old, include duty to other and duty to self. Here at Promo Pays, where we believe in an ethical business model and fair policies for our staff and clients, we certainly support these principles. For this reason, and others, we are proud to supply custom apparel to a wide variety of scout troops across the country. In our current digital age, with young people spending so much time on their phones and computers, we salute the Scouts organization for getting kids out of their rooms and into the woods. Adventuring in the woods, hiking and canoeing build an appreciation of nature and social and leadership skills, in addition to being just plain fun. The scouts have a policy of inclusion, which means that anyone can participate, regardless of race, cultural or sexual orientation. A canoeing and camping trip with the scouts can be a transformative positive experience, so we’re always happy to lend our skills as t shirt printing experts to create a memorable keepsake of that awesome end of year hike! While our printing experts can make sure that the shirts or hoodies come out perfectly, we should point out that it is actually you, the client, or the volunteers working with the scouts that actually design the product. You could even enlist the young people themselves to come up with their own design to adorn their custom shirts – when you order custom t shirts for your scout troop that they designed themselves, you will help kindle a spark of creativity and accomplishment that can be worn week-to-week! 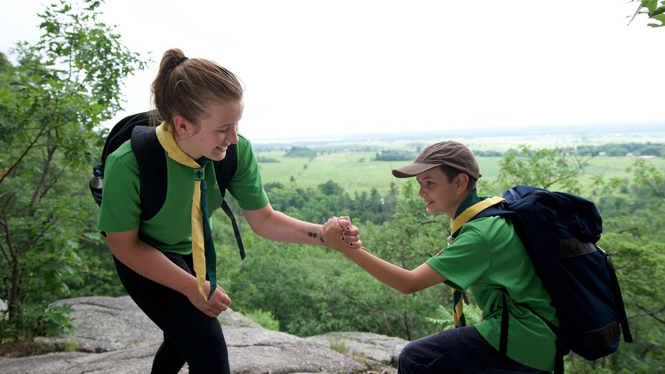 In the older scout groups, such as the Venturers (age 15-17), there are even programs that include mountaineering, learning to scuba dive and activities that promote positive environmental practices and raise awareness regarding the widespread threat of climate change. We love to be involved with creativity and leadership initiatives of this nature that promote working together, community engagement and appreciation of nature in an era that is so dominated by technology. Summer, which is currently kicking into high gear, is prime time for hiking, camping and canoeing. If you are involved with the scouts, keep Promo Pays in mind as a source for custom sweaters in Canada to outfit your troop on colder nights. By August, you may have developed a great design inspired by the summer’s adventures! Since things rapidly cool off when the summer is over, you could get custom hoodies in Toronto that reflect the good times you had in the summer, so you can stay warm and cozy while reminiscing! At Promo Pays, we believe that life is an adventure and that every day should be lived to the fullest. Whether you need custom apparel for your school club, summer business (painters, landscaping, etc.) or baseball beer league, we are happy to oblige. Adventures are great, but they’re even better when you have a t shirt to remember it! Design A Spring Tee For Your Club Or Team!